We’d love your help. 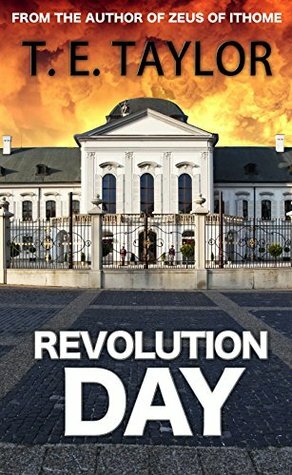 Let us know what’s wrong with this preview of Revolution Day by T.E. Taylor. Meanwhile, Carlos’ estranged and imprisoned wife Juanita recalls the revolution that bro Carlos Almanzor has been the ruler of his country for 37 years. Now in his seventies, he is feeling his age and seeing enemies around every corner. And with good reason: his Vice-President, Manuel Jimenez, though outwardly loyal, is burning with frustration at his subordinate position. To ask other readers questions about Revolution Day, please sign up. This was another great story from T.E. Taylor. Though a contemporary novel, it had a feeling of being of a historical throughout as memories of past decades unfold. Different viewpoints are skilfully interwoven as the roles of the characters in the current drama are revealed. The scenario of a young revolutionary being thrust into the prime position of authority, in a fictitious South American country a little short of forty years ago, seems very credible—even when that particular person hasn’t This was another great story from T.E. Taylor. Though a contemporary novel, it had a feeling of being of a historical throughout as memories of past decades unfold. Different viewpoints are skilfully interwoven as the roles of the characters in the current drama are revealed. The scenario of a young revolutionary being thrust into the prime position of authority, in a fictitious South American country a little short of forty years ago, seems very credible—even when that particular person hasn’t actually been angling to be ‘top dog’. The penalty dished out to Juanita, around seventeen years before the outset of the novel, was harsh but could easily have been much worse. Juanita’s an interesting character who gains some of my sympathy and though her plight is unenviable, it’s clear that people can adapt to the conditions in which they live. Carlos Almanzor, on the other hand, is quite a complex character to truly like. As the dictatorial autocrat, his word rules and blame for wrong decisions has to be accepted- which he does. However, it’s also very credible that in such an environment corruption destroys even the most visionary of idealists like Carlos. The other players in drama have more influence than Carlos reveals. I found myself unable to guess the actual ending to the dilemma and read the final pages with bated breath. The fate of the country is definitely in the balance! I enjoyed T.E. Taylor’s style of writing, heavy on the narrative in his first novel, and was pleased to see Revolution Day was similar. This book slowly grew on me until I was completely gripped. The politics resonate in our politics today in this country and brilliantly demonstrate fundamental human patterns and the way good intentions can be corrupted. The tensions between the good and evil in all of us was so skilfully written I actually wanted the tyrant dictator to defeat the machinations plotted against him. Can't wait to see what T E Taylor tackles next. The cosy, smoke filled rooms of wannabe revolutionaries are fleshed out here to dwell on what happens after. It’s South America; the revolution was fought and won long ago, consigning the evil dictator, Salgado, and his henchmen to the rubbish bin of history. You’ve won the revolution but what about the hearts and minds of those you purport to serve? No matter, because the country is rich in valuable resources. Hurrah for President Carlos Almanzor (former lawyer), they shout… but ti Regime Change! Hurrah for President Carlos Almanzor (former lawyer), they shout… but time has moved on and the annual celebration in honour of those who fell in the revolution: Revolution Day, has become a magnet for protesters. New media is creeping into the lives of the citizens, painting President Almanzor’s regime in an unsavoury light. This isn’t easy to stamp out as it originates mostly from America; the regime’s biggest export market. It’s been 37 years since the revolution and time has moved on; the president grows old. His former lover, Juanita, once a star of the revolution, has been under house arrest for the best part of two decades; the Revolutionary Council have become the Establishment, trotting out the ogre of a Salgado comeback whenever a purge is called for. His head of security, Manuel, is ambitious. Occasionally he is permitted one the perks of any self-respecting people’s revolutionary dictatorship, show trials. Revolution Day builds a picture of how the revolution of decades ago tangled the lives of the revolutionary council, poisoning their humanity. It skips between the day to day life of the president, the dairy of Juanita, his former lover, and the head of security, Manuel. The practicalities of decision making, in a third world dictatorship are captured well, as are the less savoury aspects. Manuel is ambitious, the president is old and regime change lies waiting. Tim lives in Yorkshire and is a member of Holmfirth Writers. His first novel: Zeus of Ithome is set in ancient Greece. The tale is told from different viewpoints and flips between the past and the present. Sometimes when a book does this it can be hard to keep track where you are.. not with this one. Tim’s writing flows so easily. If anything it made this tale even better as you get an insight to not only what the characters are like now bu Revolution Day is a fictional story following the events surrounding Carlos Almanzor. A man who comes to power quite by chance and things don’t go the way he would have liked. This has to be one of the best novels I’ve read this year. It’s a story of a revolution betrayed. A revolution carried out by youthful idealists led by an inspired Carlos Almanzor that loses its way and yields, as most revolutions do, to the seduction of power. Ideals are corrupted, promises broken and the revolutionaries age in office. We meet President Carlos in his seventies, his estranged wife, Juanita is under house arrest. Assassination attempts made against him, anger and puzzle him. And This has to be one of the best novels I’ve read this year. It’s a story of a revolution betrayed. A revolution carried out by youthful idealists led by an inspired Carlos Almanzor that loses its way and yields, as most revolutions do, to the seduction of power. Ideals are corrupted, promises broken and the revolutionaries age in office. We meet President Carlos in his seventies, his estranged wife, Juanita is under house arrest. Assassination attempts made against him, anger and puzzle him. And his trusted Vice President, Manuel Jimenez is conspiring to replace him. Revolution Day is an engrossing read with a neat, satisfying end. Well conceived and plotted, it’s a fine piece of writing by any measure. And it’s a novel; not part of a “series” or a trilogy, but a straightforward novel standing on its own; an increasingly rare find on Amazon Kindle today I find. I recommend this book to all who enjoy a good, quality suspense thriller and good solid writing and I look forward to more from this writer. In a way, I co Who can a revolutionary trust?